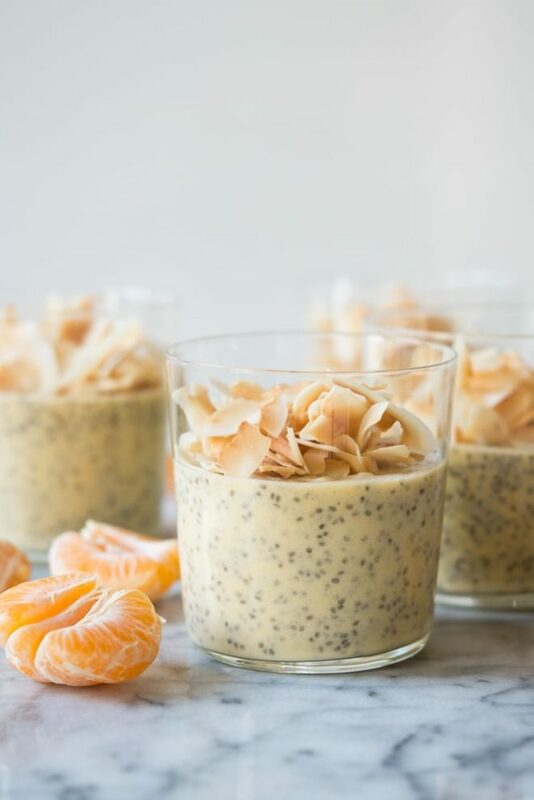 This dreamy, creamy, satisfying Paleo creamsicle chia pudding contains no added sweeteners and will squash even the biggest craving for dessert! I'm almost embarrassed to admit how many attempts it took before I landed on this recipe. Short story: it took me 3 tries and I had to go back to the store for black chia seeds TWICE. Sometimes recipe development feels a lot like chipping away at a buried fossil. You have an idea (maybe even hopes) of what you're unearthing, but there's no way to know exactly what lies beneath until it has been completely extracted and dusted off. 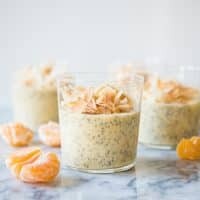 Note that I've made chia pudding before (see one example here), but I really wanted to incorporate citrus in this recipe! Citrus is in season and I wanted to offer up a Fed & Fit Project-compliant dessert for everyone working so hard in that material. First, I worked with just citrus juice, and then just fruit, and then finally a combination of fruit and coconut milk. While the chia seeds will plump and soften as they absorb some of the liquid surrounding their cute little bodies, there's only so much liquid they can take. I've found that in order to achieve a pudding-like consistency, a full-fat coconut milk *must* be added. Alas, it worked!! In fact, it exceeded my expectations. Instead of a citrus chia pudding, we have a CREAMSICLE chia pudding. It was more delicious and more satisfying than I thought possible. 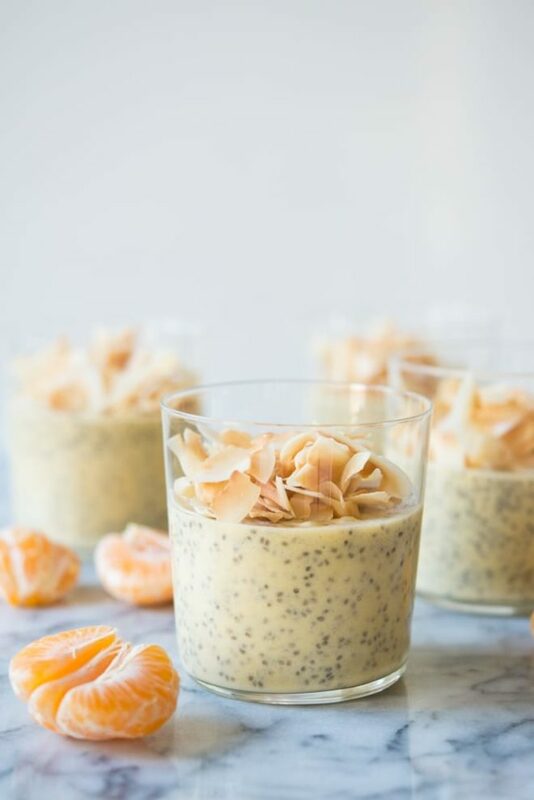 For this creamsicle chia pudding recipe, I used 2 full cups of peeled clementine segments (because they're just so darn easy to peel) and one can of full-fat coconut milk. I blended those two ingredients together until smooth and slightly frothy. Stir in the chia seeds, let set for at lest 4 hours while the seeds can do their plumping magic, and then serve! 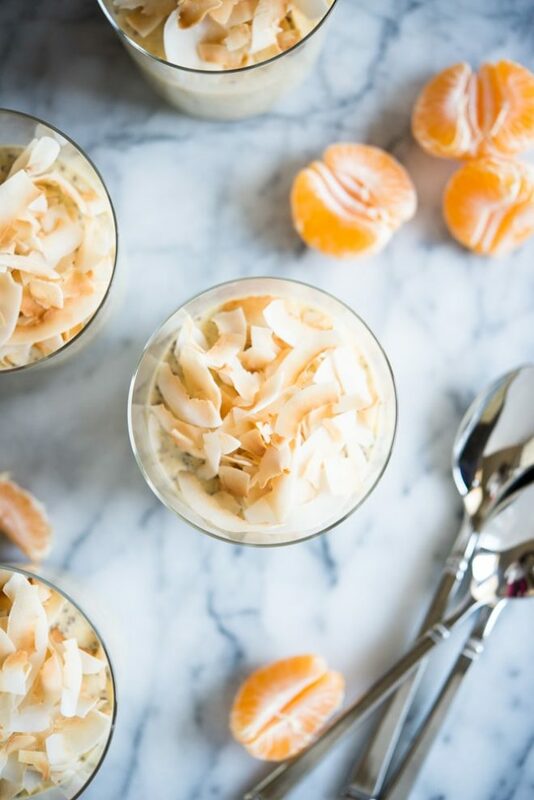 To garnish, I topped these little pudding cups with some toasted unsweetened coconut shavings. The texture combination (especially when fresh) was AWESOME. If you love chia pudding, you might also love our Red, White, and Blue version HERE! If you're *not* working within the scope of the Fed & Fit Project and do like to incorporate natural sweeteners into your diet, I recommend adding a tablespoon of maple syrup or honey to the blender! 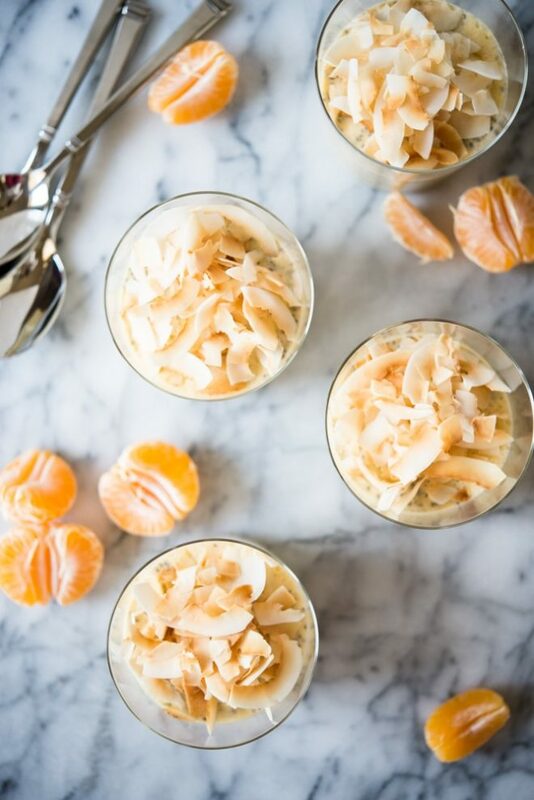 Place the clementine segments and coconut milk in a high powered blender. Blend for at least 2 minutes, or until completely smooth. Pour the mixture into a large bowl and add the chia seeds. Stir to combine and then transfer to the refrigerator to set for at least 4 hours. To toast the coconut shavings, spread them out on a parchment paper-lined baking sheet. Bake at 375 for 5 to 7 minutes, or until golden brown. Be careful not to burn the coconut and check on them often. To server, spoon the pudding into cups and sprinkle the coconut on top. White chia seeds work, too! I tried this one. YUM!!!! 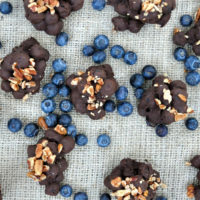 I’ve never made anything with chia before, but am curious to make this recipe! This might be a silly questions, but do you chew the seeds? I’ve only had them in GT’s Kombucha, and I do remember chewing them…kinda… But when made as a pudding…. Hm? It’s going to be a long four hour wait! Just the bit I licked from the spoon was delicious. This was dangerously good! I didn’t have any coconut shavings in the house so I missed out on that bonus but I did add almond extract for a twist and it was amazing. I had never tried a chia seed recipe before this, it is wonderful!! I cannot wait to try some more recipes. I’m surprised the clementine membranes don’t influence the taste! I’m remembering how bitter that can be with regular oranges, but maybe it’s not an issue with clementines? Sounds delicious! Wow, another great chia pudding to try. Why coconut milk? Any nut milk will do, too, right? Thank you for this! I just like the extra creaminess offered by the full-fat coconut milk. You can use other ones, just know that the consistency may change a bit. Hope that helps! 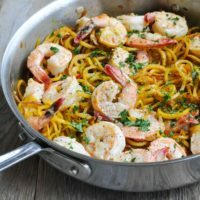 Perfect, exactly the recipe I was needing, I’ve seen this in some places but I’ve never done it because I thought it was difficult but now that I’ve seen in your article that it’s simple to do, that’s great thank you. You’re so welcome! I hope you enjoy it! The Hubs and I both liked this, but the kids did not. I added honey because our Clementines were not super sweet. Thanks for the recipe! 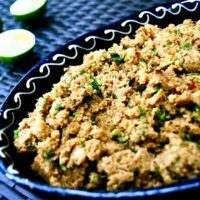 Perfect recipe, looks like it was made for me, I have to do it urgently, I was looking for something like that, thank you very much for the recipe. 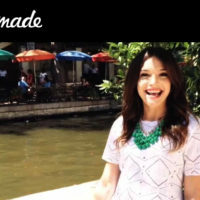 Very practical and easy to do, I did not know it was that simple, I’m sure to do. Looks great!! i’ll try out this recipe for sure! I don’t have enough time to chill it in the fridge! – is it possible to freeze it for a shorter amount of time/freeze it and eat it like that? Thank you very much for the recipe, very easy to make and very tasty too, congratulations !!! I received a pop up saying cook once eat ll week and I subscribed. I had to confirm in my e-mail. It had a link that said “confirm and download”. When I click on the link it opens a page and then immediately closes it. Im really bummed out. Can you share the calorie and nutrition info please? I added honey because our Clementines were not super sweet. Thanks for the recipe! Smart! So glad it was good!